Question : Give me the detailed information related to the GMAT Score Percentile? Is GMAT is required for admission in Indian School of Business? You have to take the GMAT and submit your score before sending in the application for admission in Indian School of Business. Currently a GMAT score is valid for 5 years. The GMAT Score for ISB Hyderabad range is 640- 760.More or we can say that the 2 years of experience and 730+ score can arrange interview call…. The GMAT score is a must for admission to the ISB mba. You must enclose the test center score with the application and make sure that the school receives the official score from the ETS within three weeks. The score is valid for 5 years. In case of more than one GMAT score your highest valid score is considered. The school does not consider the CAT score and in exceptional cases candidates without work experience are admitted. Part-time work is not considered as experience. The fee of the course is INR 15,00,000 per annum. Living, books, Laptop charges of INR 2,63, 000 per annum are charged extra. Question: Give me average GMAT score for admission in Harvard University? Give me list of Average GMAT Scores at Business Schools. The score details are as followings. Question : Please provide me the calculator for calculation of GMAT Score? The Graduate Management Admission Test (GMAT) is conducted by Graduate Admission Management Council (GAMC), The candidates can get admission in many Post Graduate Management Courses in different foreign institutes. 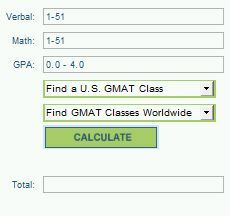 I am forwarding a link from where you can get the calculator for calculation of GMAT Score. By going on above link it’ll display a page that looks same as the snap shot given below, on that link first of all enter all required info & then click on calculate. Question: Provide me GMAT Calculator. Answer: You are looking for GMAT Calculator so there is no any official site for GMAT Calculator but it is available on many other site where you can take tentative idea about GMAT Score. The average GMAT score worldwide is 570. There is no “acceptable” or “minimum” score. What score you should obtain depends on which school you are going to apply to. Generally, the higher the school ranks, the higher score you must obtain. For the top 50 programs, the averaged GMAT score is 660. Things could be different if you are not so particular about applying to the ranked MBA programs. The GMAT could be one of the most important factors for admission. If you have a score that is much higher than the average GMAT score indicated by the university, your chances of admission are really good as long as you fulfill the basic requirements. Give me some GMAT Sample Questions? Who introduced the time management categorization scheme for categorizing the hundreds of approaches that were used for time management? The fourth generation time management approaches were based on which of the following principle? Which of the following scheme used watch and clock based reminders for time management? Fill in the blank by choosing the most appropriate option of the following choices. Time management does not necessarily mean that you should do _____________? What are the qualities required in order to master the art of time management? If you drink beyond the permissible limits then your health benefits are lost and your health risks go up. The statement above logically conveys which of the following? The non-alcoholic contents of wine, such as flavanoids and resveratrol, serve as antioxidants that prevent the “free radicals” or the special type of molecules from damaging the vital body cells. Severe smoking can significantly damage the natural capability of the blood vessels to contract and relax. From which of the following can the statement above be most properly inferred? The geographic origin of the grapes as well as its type and its way of processing play an important role in deciding the nutritional value and the amount of antioxidants in it. Some scientific researches have proposed that though the content of anti-oxidants in the whole grapes is same as that of grape juice and red wine, they provide the body with additional dietary fibre.